In this post I’d like to talk with you about another core idea that I had for zCasting 3000, when I started it: Nakama. If you follow me, you know that one of my most favorite animes of all time is One Piece. Monkey D. Luffy, the captain of the Flying Lamb, is one of my biggest idols. A comic figure, yes, but that doesn’t make his story any more outstanding. Nakama struck me as a concept, when I was wondering who created a character like Luffy. Monkey can teach us many valuable lessons on crisis management and leadership, but also on team building. When he starts his journey, Monkey has nothing. No money, no boat, no crew. He’s a startup. But soon after he start his journey, he finds other people who can kind of see his dream, and they follow along. What Luffy does, as they go from one dangerous place to another, is that he makes sure that every new team member does not only become part of a crew — they become part of a family. If you just hold that thought for a second, this is really quite remarkable, I think. Instead of saying he needs a bigger and better team, Luffy works with what he’s got. He doesn’t latch on “more stuff”. What he’s got, is good enough. Instead of augmenting the team members, he augments the team from the inside. He makes sure that every crew member can count on their team mates — blindly. Considering the dangers they face in every episode, it seems a very good decision to count on friendship, rather than tools. Wouldn’t you want your mates jump in front of a pistol and capture the bullet, without thinking, (which, by the way, happens a lot of the time in One Piece) just because it’s the most natural thing to do? How does a team sound where folks reach out to each other, and help each other to achieve their goals and grow? Where one hand helps out the other, where people can work freely and live up to their full potential. I am aware that the way a picture describes a scene is more colorful and detailed and bright and shiny, than the reality. But that doesn’t count. What counts is that this is a nice picture to have in ones mind, because it feels good. It’s nice to think that at the end of the rainbow is a nice place to be at. Of course the reality looks different, there are jerks, and assholes. People who tell us we’re not good enough, but that’s part of the journey! It’s part of getting to the Grand Line. It’s part of finding the treasure. Nobody in Monkey’s team knows how the treasure looks like, not even him, he does. Monkey makes up the dream as they go, and it’s a nice dream to have. It keeps people moving. And so when I thought about building teams I came across writings that said that women build friendships different than men. Their connection goes “deeper”. From this my first idea sprouted that I wanted to have a team consisting of women, because I thought building a family would require one kind of team members. I was taught wrong when friends told me about a study that teams of equally enough men and women can achieve more in the work force. This meant I had to refocus my first approach slightly by 50%. 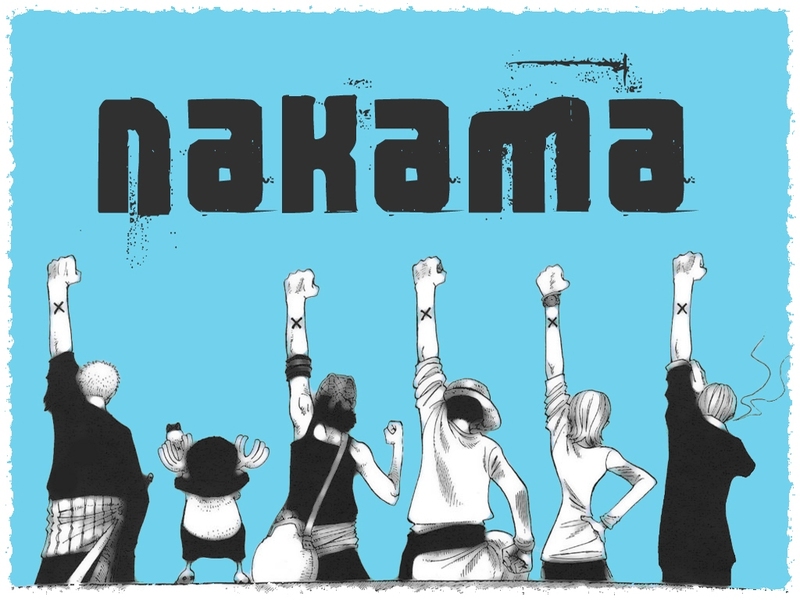 The concept of Nakama seemed like a good approach. Because, let’s face it and get back to reality, this all looks nice in my head. It is colorful, and bright, and shiny, but reality is different. In reality why would you want to have friend people? Because as you build a company, those first few crew members are going to be your project leaders. The ones who are so close to you like nobody else in the company. As chief, you need to trust those people — blindly. In one of the next posts I’d like to write about another principal: love.